AUD/USD: End of a Rally? – Orders Cancelled Just in Time! Phew! Saved myself from a heartache on this one! As I mentioned in my trade plan, I’d be watching out for economic catalysts extra cautiously after I got burned on my previous AUD/USD trade. 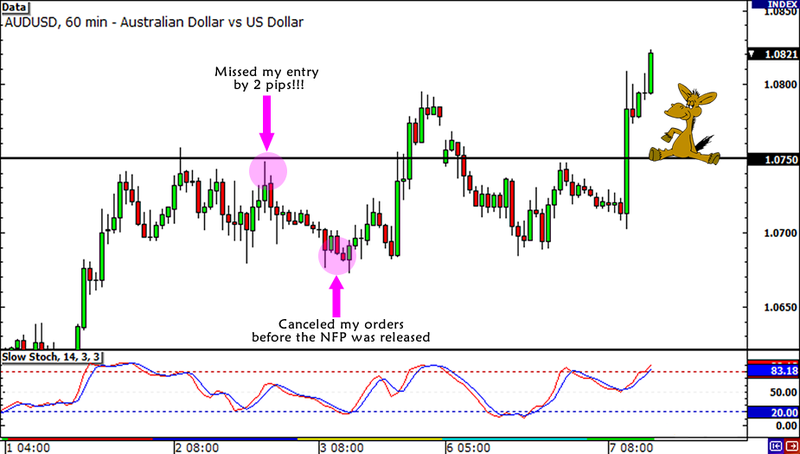 Since the trade didn’t get triggered prior to the U.S. NFP release, I decided just to cancel my open orders to avoid any event risk. Besides, as I promised in my trading resolutions, I would no longer hold trades open over the weekend. To be honest, I did think of re-entering this week prior to the RBA rate statement. However, I decided against it, thinking that it would probably be better to wait for the actual decision first. Now that the RBA announced that it’d keep rates on hold at 4.25%, I think I should drop my bearish Aussie bias for now and look for other setups on the rest of the comdoll pairs. If you have any ideas in mind, you know where to reach me! On to the next comdoll setup! With AUD/USD Australia printing disappointing economic reports and AUD/USD reaching an important resistance level, I say it’s time for a reversal! Since January we’ve been seeing Australia print one weak report after another, from its leading indices to the CPI, new home sales, house price index, and building approvals report. Not only that, word from my forex friends is that the RBA will cut its interest rates again next week after reducing it by 50 basis points in the last two months. Of course, we can’t forget that China printed a surprisingly weak GDP report early this year! On the technical side, I’m hoping that Big Pippin’s AUD/USD setup on the daily chart will play out like many of his other setups. 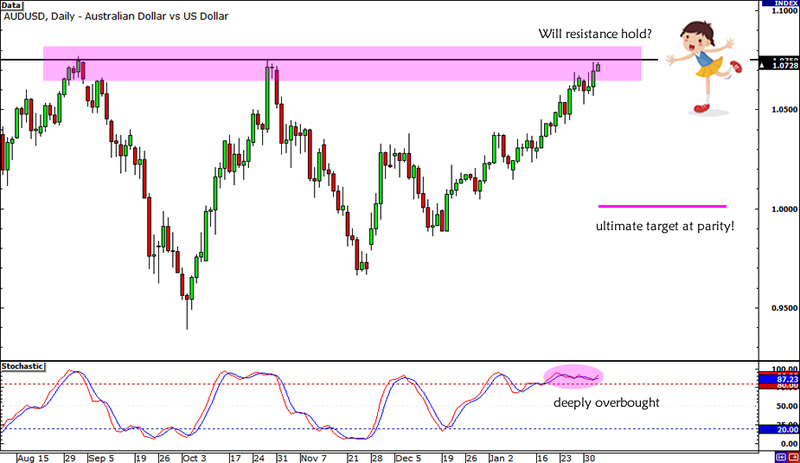 The chart shows that AUD/USD is testing the 1.0750 handle, which was a good resistance level in September and October last year. With risk appetite currently dominating the markets though, I’m placing my entry level right at the 1.0750 handle. I know I missed a good entry a couple of hours ago, but I believe that Australia’s recent trade balance data can give the pair a boost back to the resistance level. Enter at 1.0750, Tight stop loss at 1.0850 (above 1.0800 and weekly ATR area) with my first profit target still yet to be determined. I’m also thinking of looking at the bigger picture and aiming for the stars. What if I short AUD/USD at 1.0750, put my stop loss above the record high near 1.1000 and aim for parity? That would yield me a nice 750 pips! Just a thought, of course. So, what do you think of my trade idea? Do you think we’re seeing the end of AUD/USD’s rally? As always, don’t hesitate to hit me up with any questions or concerns! Chips, dips, and many many pips!